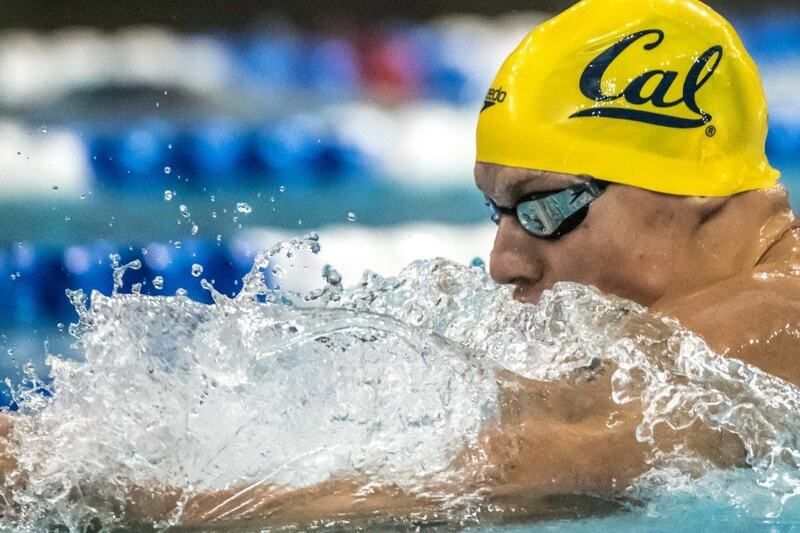 The Cal men are looking good to repeat as Pac-12 champions with a loaded team top to bottom. Per the Finis Swimulator, the Golden Bears have ten swimmers who would score 40+ individual points if the meet were to be scored right now based on times done this season. They’re led by Andrew Seliskar, who has been on fire all year after a breakout summer. Singaporean Zheng Quah is the fastest swimmer in the country this year in the 200 fly and the fastest in the conference in the 100 fly, Pawel Sendyk, Michael Jensen, and Ryan Hoffer spearhead a loaded sprint group, and freshman Reece Whitley is a national title threat in both breaststrokes. Stanford doesn’t have the depth to take out Cal like they did in 2016 and 2017, but they still boast a strong roster that’s bolstered by freshman Jack LeVant. Brooks Fail and Chatham Dobbs have both been swimming lights out this season which gives Arizona a great chance to move past USC into 3rd, as the Trojans suffered four major losses after last year, particularly Dylan Carter and Santo Condorelli. Arizona: Chatham Dobbs (senior sprinter), Brooks Fail (sophomore freestyler), Jorge Iga (junior sprint freestyler), Sam Iida (sophomore IMer), Isaac Stump (backstroker/IMer), Brendan Meyer (junior freestyler/flyer) – Despite losing two of their three individual NCAA scorers to graduation in Justin Wright and Nick Thorne, plenty of Wildcats are having standout seasons. Chatham Dobbs ranks inside the top-4 in the conference in four events, including 1st in the 100 back, and Brooks Fail leads the Pac-12 in both distance free events. Arizona State: Zachary Poti (junior backstroker), Grant House (sophomore freestyler/IMer), Danny Comforti (senior breaststroker), Carter Swift (sophomore sprint freestyler) – The Sun Devils have seen some big senior losses, along with the departure of Cameron Craig from the team. Zachary Poti is ranked 2nd and 3rd in the 100 and 200 back respectively in the conference, and Grant House had a breakout 1:33.3 200 free at the IU Invite, but the team will be in tough to top Arizona like they did last season. 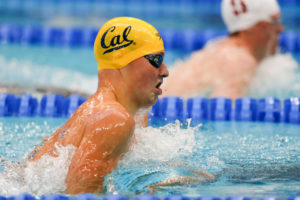 Cal: Andrew Seliskar (senior free/breast/fly/IMer), Zheng Quah (junior backstroker/flyer), Pawel Sendyk (junior sprint free/flyer), Mike Thomas (senior flyer/IMer), Ryan Hoffer (sophomore sprinter), Reece Whitley (freshman breaststroker), Sean Grieshop (sophomore IMer), Trenton Julian (sophomore free/fly/IMer), Bryce Mefford (sophomore freestyler/backstroker), Michael Jensen (junior sprint freestyler), Nick Norman (senior distance freestyler), Daniel Carr (sophomore backstroker) – This Cal lineup is stacked to the brim and shouldn’t have a problem repeating the title they won in 2018. 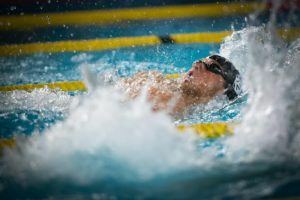 Andrew Seliskar has been swimming on another level this season, and the team essentially has no weaknesses throughout all strokes and distances. If he is cleared to compete, Hugo Gonzalez will also be a big contributor. Stanford: Abrahm DeVine (senior IMer), Jack LeVant (freshman freestyler/flyer), Alex Liang (sophomore flyer/IMer), True Sweetser (junior distance freestyler), Matt Anderson (senior breaststroker), Patrick Conaton (senior backstroker), James Murphy (junior freestyler), Brennan Pastorek (sophomore breaststroker/IMer), Daniel Roy (freshman breaststroker) – The loss of Grant Shoults to injury is a big one for this group, but they’re well equipped to trudge on without him. Abrahm DeVine has a great shot to sweep his individual events, though he’ll have to take on Seliskar, and Alex Liang, Jack LeVant and True Sweetser all project to put up big points as well. Southern Cal: Carsten Vissering (senior breaststroker), Nikola Miljenic (sophomore sprint free/flyer), Patrick Mulcare (senior backstroker), Alexei Sancov (freshman freestyler), Victor Johansson (freshman distance freestyler), Alex Valente (senior flyer) – Another team riddled with key losses (Santo Condorelli, Dylan Carter, Robert Glinta, Ralf Tribuntsov), they’re currently projected to finish 100 points back of Arizona for 3rd after finishing over 158 points clear of 4th place ASU last season. Seniors Carsten Vissering and Patrick Mulcare do, however, come in with a great shot at individual titles ranked 1st in the 100 breast and 200 back respectively. Utah: Daniel McArthur (senior backstroker/IMer), Austin Phillips (senior freestyler), Rodolfo Moreira (sophomore sprint freestyler), Clay Stoddard (sophomore sprint freestyler), David Fridlander (freshman backstroker) – McArthur and Phillips have both had strong seasons and project to put up some big points for the Utes. McArthur should be an ‘A’ finalist in the backstrokes, as should Phillips in the 100 and 200 free. This conference is loaded with top tier 200 freestylers. Nine men have been sub-1:35 so far this season, led by Andrew Seliskar who dropped a 1:30-point during invite season. 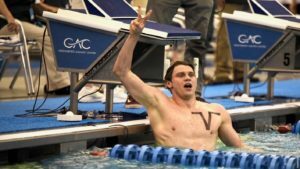 It remains to be seen whether or not he’ll swim the event, but it seems very likely considering he hasn’t done the 400 IM at all in 2018-19. Behind him are freshman Jack LeVant and Alexei Sancov, both of whom will be contenders in this event for years to come, and both Grant House of ASU and Jorge Iga of Arizona have been 1:33 this year. The 100 back was so close last year that three men tied for 1st place. All three won’t be there this time, but it still projects to be an insanely close battle. The top four men in the conference this year are separated by just 0.21, led by Chatham Dobbs (45.69) of Arizona, and then Zachary Poti (45.74), Bryce Mefford (45.78), and Patrick Mulcare (45.90). The next two fastest, Daniel Carr and Ryan Dudzinski, were sub-46 last season. The 200 IM will mark the fourth straight battle between seniors Andrew Seliskar and Abrahm DeVine. Seliskar won and DeVine placed third in both 2016 and 2017, but the Cardinal got the win over the Golden Bear last season by nearly seven-tenths in a time 1:41.17. This season Seliskar has been a blistering 1:40.55, just 0.15 off his lifetime best, while DeVine sits 2nd in the conference in 1:42.71. Behind those two there’s a strong supporting cast led by Seliskar’s Cal teammates Zheng Quah and Mike Thomas, and DeVine’s Stanford teammates Alex Liang and Brennan Pastorek. The Cal men are simply too stacked this year and shouldn’t have a problem defending the title they won last season. Stanford, who won back-to-back titles in 2016 and 2017, don’t have the stars to be able to match up with Cal, but are still a comfortable 2nd. Arizona is looking good to jump up into 3rd after taking 5th last year. How. He hasn’t even cracked 51…. he is 5th in the country. off topic.. but where was Jake Sannem for Texas last week? He didn’t swim at Big 12’s and his highest ranked swim is the 24th in the 200 free at 1:33.65.This seems like this swim will be on the bubble. If he is on the bubble then so is Newkirk and Sam P. Based on their swims they both looked like they didnt rest. 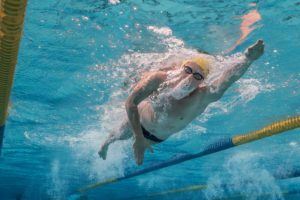 Koustik needs a last chance swim to get in. Seems awfully tight to just assume these guys are going to qualify in one of the last spots. Sannem scratched i dont know why. Maybe some of the guys on the 200Fr list will do other events.. Rooney is one so maybe they are really a few slots higher. Krueger is currently ranked 17th in the 100 free. 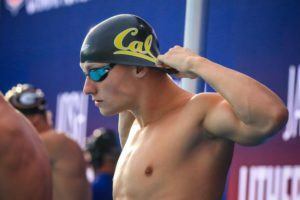 There’s 1 Pac-12 swimmer faster than him so far. Only 5 Pac-12 swimmers all of last season were faster than him in the 100 free (and 3 of them were seniors). So, he’s not quite a ‘stone cold lock,’ but Austinpoolboy is correct – he’s pretty safe. Collegeswimming.com database looks to have him 22nd… I guess that’s probably safe, but there are at least 3 or 4 guys behind him that seem like a good bet to jump ahead. so I don’tknow if it’s a lock. No times count until they’re in the NCAA database, so that’s what I based it off of. the CSs.com databasses usually have errors. For example, it looks like all of the Michigan vs. Northwestern dual meet relay splits are showing up as flat-start times. It’s the one that counts. Yeah, they have American Short Course Champs meet usually. Sam needs some help, he’s really bubbly. Koustik needs to put up something. Sannem and Newkirk are close but I bet they’ll be fine without dropping.